“Be an outlaw, be a hero”. 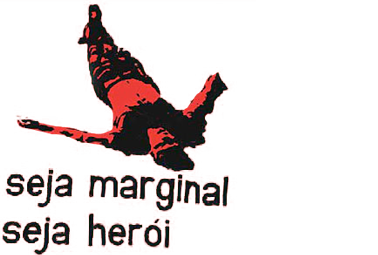 With this phrase, Hélio Oiticica synthesized a series of works that became known as ‘marginália’ or ‘cultura marginal’ (fringe or underground culture). ‘Marginália’ was part of the Brazilian cultural scene from the end of 1968 up until the mid-1970s. It was in this period that fringe cinema appeared, in the pioneering films of Rogério Sganzerla and Ozualdo Candeias, and the alternative press, in newspapers and magazines such as O Pasquim (The Satirical Leaflet), Flor do Mal (Flower of Evil), Presença (Presence) and Bondinho (The small tram). In literature and in poetry, marginália is associated with the work of authors such as José Agripino de Paula, Waly Salomão, Francisco Alvim, Gramiro de Matos, Torquato Neto, Charles and Chacal. In the field of music, the idea of the beyond-the-fringe artist was expressed by the label ‘músico maldito’ (damned musician) of which the main names of the period were Jards Macalé, Sérgio Sampaio, Jorge Mautner, Luiz Melodia, Carlos Pinto and Lanny Gordin. Marginália has its origins in the works of a string of artists, principally those linked to the intellectual group who embodied Tropicalism in 1967 and 1968. But after the prison and exile of Caetano Veloso and Gilberto Gil, the creative output of movers and shakers such as Rogério Duarte, Torquato Neto, José Carlos Capinan, Hélio Oiticica, Waly Salomão turned in a more radical and transgressive direction. On December12th, 1968, the journalist and photographer Marisa Alvarez Lima wrote an article in the magazine O Cruzeiro (a Paris Match-style weekly) entitled “Marginália – arte e cultura na idade da pedrada” (“Marginália – art and culture in the stoning age”). It was the first to define “marginal” culture and list its main protagonists. Through the creative relationship between Brazilian artistic expression and the daily social grind of the big cities, marginália began to incorporate a series of elements and representations of daily violence, with the aim of criticizing conservative attitudes in society. It was the fruit born of the advance of counter-culture in Brazil, and it was often associated with the idea of desbunde (letting it all hang out) or of curtição (digging something, grooving), terms used by a section of Brazilian youth of the period. The most important artworks that come into the category of marginália, include films such as “Câncer”, by Glauber Rocha (1968), “A Margem” (The Edge), by Ozualdo Candeias (1967), and “O Bandido da Luz Vermelha” (“The Red Light Outlaw”) by Rogério Sganzerla (1968); books such as Me segura que eu vou dar um troço, (Hold me down, I’m going to have a fit) by Waly Salomão (1972), and Urubu-Rei, (King Vulture) by Gramiro de Mattos (1972); articles by Hélio Oiticica, Rogério Duarte, Décio Pignatari and the Campos brothers, published in the alternative press, such as Flor Do Mal (Flower of Evil), Presença (Presence) e O Verbo Encantado (The Enchanted Verb) - all from 1972; besides the columns written by Torquato Neto in the Rio newspaper Última Hora, under the iconic title of “Geléia Geral” (“General Jam”) and, last but not least, the compendium Navilouca (Crazy Ship/Ship of Fools) (1973), that was to have only one issue. After a fervent period of production in the cinema, the press, popular music and in literature, the protagonists of marginália gradually fell apart as a group, going off in search of individual directions. The ‘official’ ending is held to be Torquato Neto’s suicide in November 1972. The last group event was the launch, in 1973, of Navilouca, which Torquato and Waly Salomão had worked on throughout the previous year. arte, antiarte ou o quê? o que ficou da poesia marginal?